It was all in the name of business. 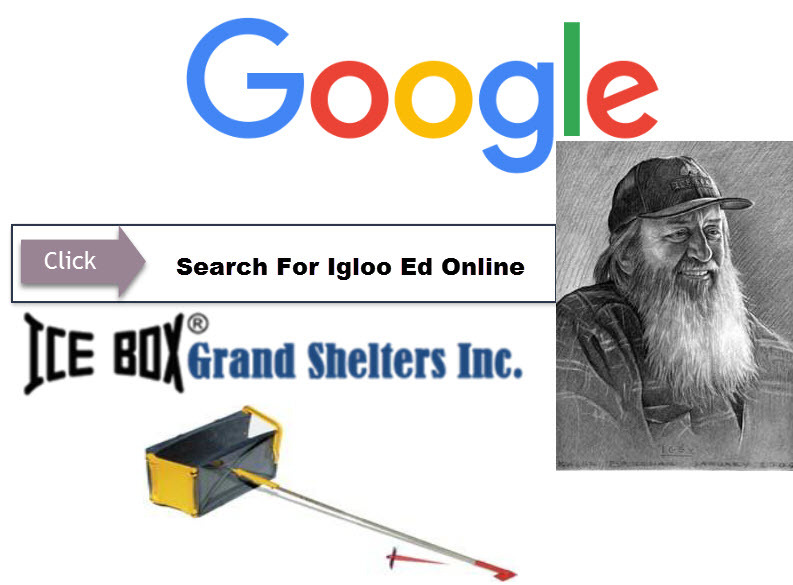 In August, Huesers hopes to begin mass producing his Grand Shelters igloo slip forms, designed for winter campers tired of getting soaking wet and exhausted shoveling out a snow cave. 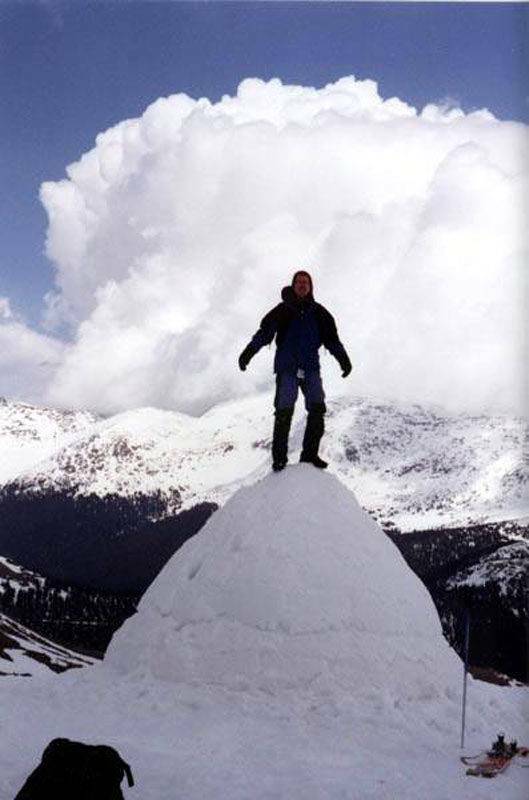 His invention, he said, produces a perfectly shaped igloo every time, and allows campers to stay dry and conserve their energy. “It takes three to four hours to dig a snow cave and you are completely shot when you are done,” said Huesers, 49, an avid winter camper who makes injected plastic molds for a living. With this thing you can still have an evening after the shelter is done. You’re not so tired.”After years of fiddling with prototypes in his garage, Huesers and his longtime camping buddy, Guy Menge, came up with a winner last spring. The compact 4.5 pound kit consists of: Three black plastic sides that snap together in the shape of a giant three ring binder; a fourth piece which slides into the ‘binder,” allowing the builder to cinch up and loosen the sides; and a collapsible aluminum rod. When put together, the “binder” resembles a rectangular black box with no top or bottom. 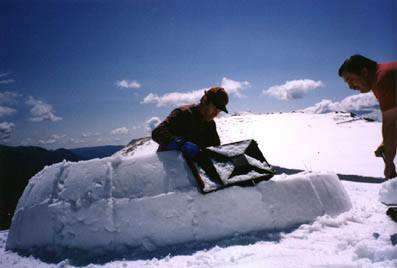 As one person shovels snow into the box, the other cranks the sides together and packs down the top, then loosens up the sides and moves on to the next spot, leaving the molded snow square behind. An attached aluminum pole, staked to the ground at what will be the center of the igloo, guides the igloo makers on their circular course. Once they reach the first block again, they begin to spiral up, building layer upon layer. Numbered holes on the pole correspond with each layer, guiding the igloo makers to ensure that each layer is precisely the right distance from the center. Longtime mountaineer Gary Neptune, owner of Neptune Mountaineering in Boulder, wholeheartedly endorsed the product after watching Huesers in action last winter, and plans to carry the slip form in his shop next fall.